I posted on Facebook last week that it was all about changing up workouts for me last week. My workouts last week were on the lighter side, which is ok. It’s good to give your body a little break from the high intensity/impact workouts sometimes. I did a LOT of walking- both at lunch and after work since I went to 2 classes in the city, so that was a nice change of pace. Monday- I still had a stomach ache when I woke up and was nervous about teaching my 6am class, but surprisingly enough, as soon as I started moving, I didn’t notice my stomach ache! There was just one girl in class but we had a killer workout! 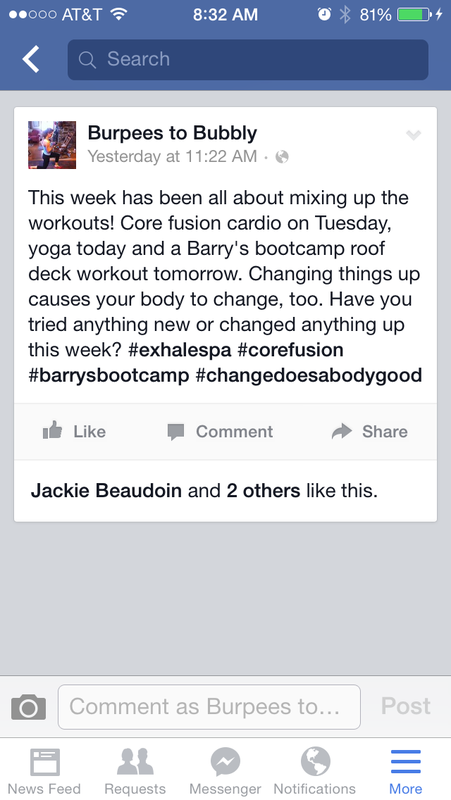 Tuesday- I went to Exhale Spa for a Core Fusion Cardio class. 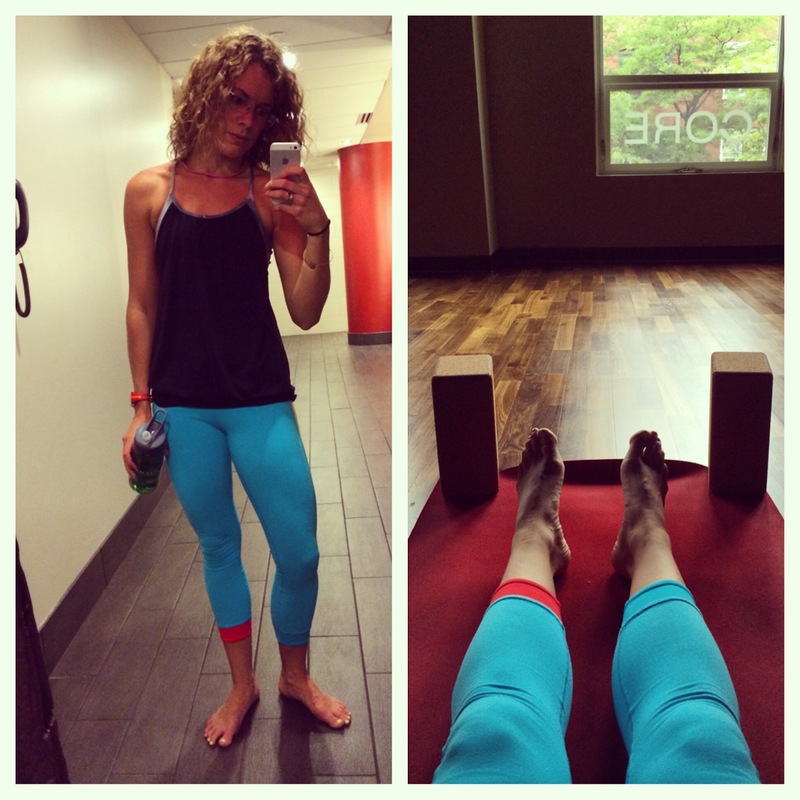 I usually go to classes where Chrissy Snyder is teaching (because she’s amazing! ), but she wasn’t teaching on Tuesday and that’s when I wanted to go so I went to a different instructor. She was good, but it wasn’t nearly as hard as Chrissy’s classes. Oh well! Wednesday- My blurry eye thing was bad in the afternoon so I opted to go for a walk instead of run. I walked 20 minutes at lunch and power walked another 20 before teaching. I did about 50% of the class with my UXF Burn group- I hadn’t planned on doing any, but when I get in there and feel their energy, I can’t help myself! 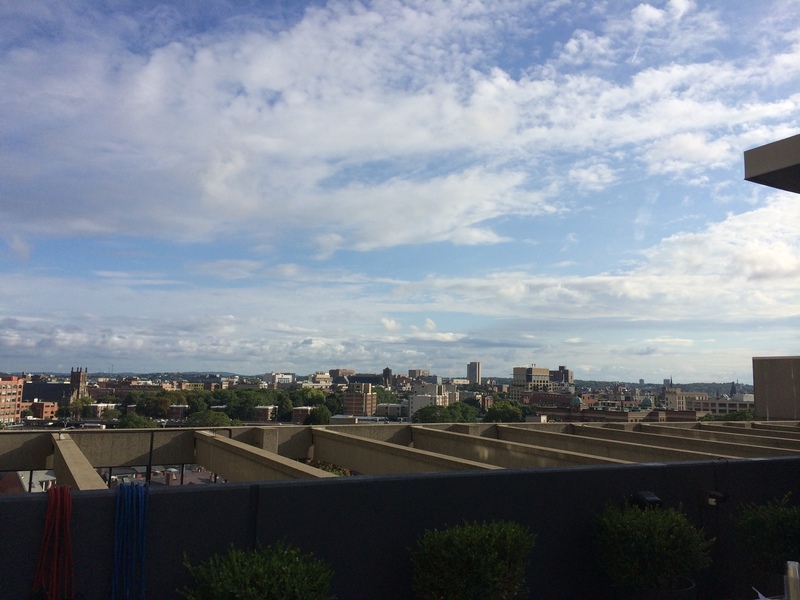 Friday- I went to a Barry’s Bootcamp workout on the roof deck at the Revere Hotel. I thought it was a good workout, but it wasn’t as hard as I was thinking/hoping it would be! Still learned some good moves and got to workout with these beauties so I can’t complain! Saturday– Nothing 🙂 We walked the Marginal Way in Ogunquit but besides that, nothing. 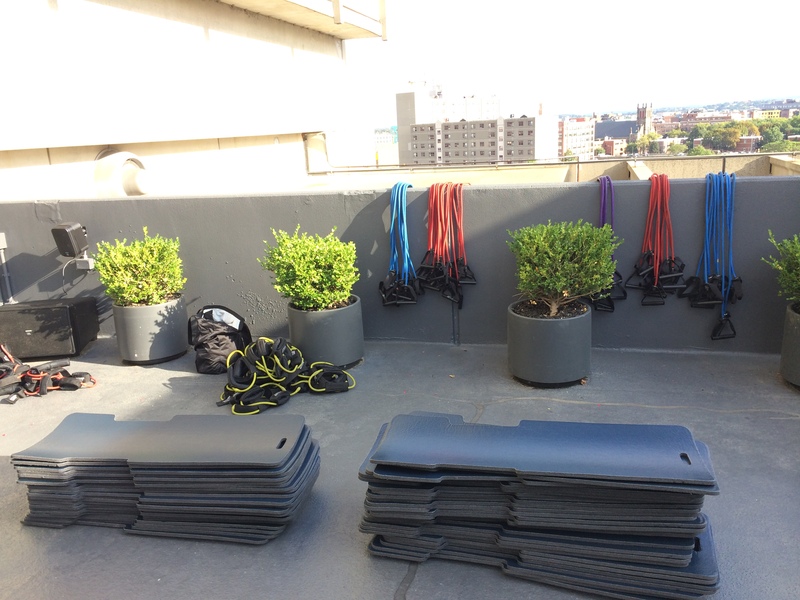 Sunday– ANOTHER rest day! I don’t remember the last time I took 2 rest days in a row… it was actually nice. I’m teaching a lot this week so I figured it was best to rest. RM and I went on a 2 mile walk in the morning which was a nice way to wake up! Monday- I’m subbing the 6am Muscle Work class and will do some cardio after. 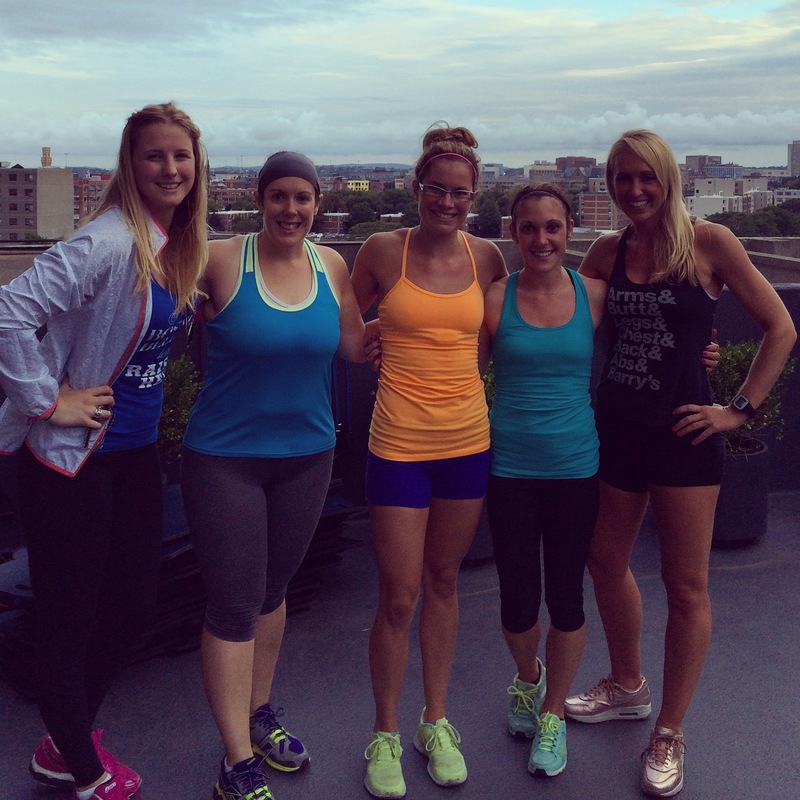 Tuesday- My friend Christy’s sister-in-law, Kerri, asked if I was up for leading a bootcamp for her and her friends. Umm, yes! of course I was up for that! Tuesday is our first session and I am excited! Wednesday- Probably some light cardio before teaching UXF Burn. Thursday- I’m subbing my old double! SHRED and Cardio Kickboxing- I’m so excited!!! Saturday- Teaching Cardio Kickboxing at the Oak Square YMCA before heading to Maine for the long weekend. Sunday- Not sure- maybe a walk with my mom and/or sister? maybe a bootcamp with them? maybe rest? Questions for you: What was the best workout you had last week? Did you try anything new? What are you looking forward to this week? Has your summer gone by fast? Bummer to not feeling well – hope you don’t have anymore of those weird headaches. I like to mix up my workouts but lately I’m just doing a lot of running!! thanks, Kim- so far, so good! Trying desperately to find the pause button on summer. For the love of beach weekends and ice cream scoops… where is the dang pause button!!??!! Hahaha- if you find a pause button, please let me know!! That Barry’s rooftop class looks so cool! I would love to do something like that! Alison it was so fun! I would love to be able to get to classes like that on a more regular basis so that I could actually see a difference from them. Yes, running in the Miami heat is not a good idea! Me either, mom! I’m SO excited!! 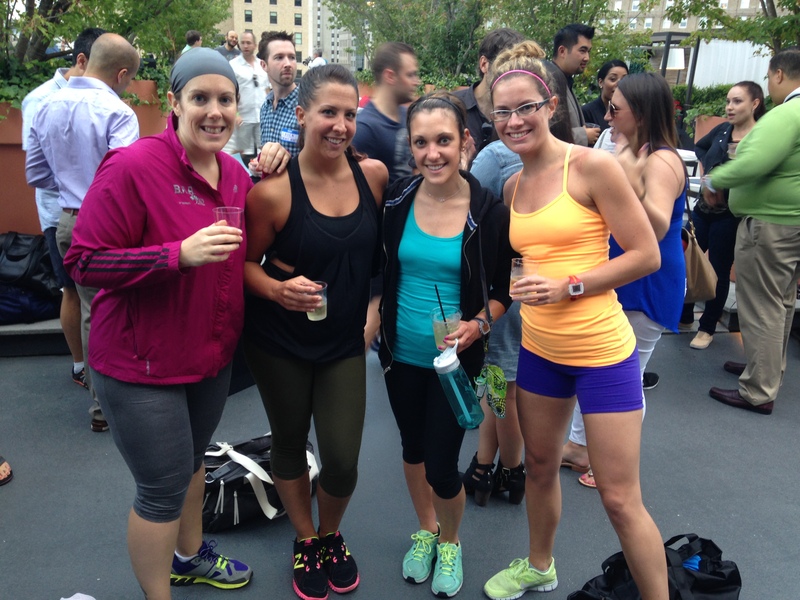 I would LOVE to do a Shapleigh Bootcamp- for sure!